Born in 1961, in the state of Brandenburg, Michael grew up close to the forest and game hunting, being the son of the forester Olgerd Igor Jankowsky. Soon, he began to collect knives and later finished his training as a cabinet - maker. Over the year, with his knife collection growing, he discovered an interest in knife making and in 1997, filed his first out a piece aof ATS-34 steel. Today, Michael specializes in making Integral knives from PM-steel "ELMAX"
"The design of my knives is influenced greatly by my feelings. It is my veryown distinctive handwriting. The results are handy Drop Point Knives or, at times, a nice Chute-Knife. 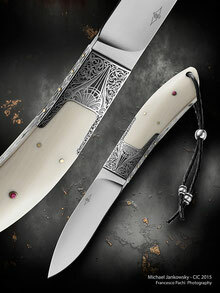 Most of my knives are commissioned work, often embellished with exclusive engravings". 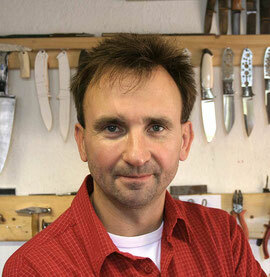 In 1999, Michael took part in the IMA - Munich, his first international professional knife show. 2000 member of the German Knife Makers Guild, DMG. In the IMA - Munich of 2001 Michael was awarded "Best Art Work" of the show for one of his knives. In 2008 he became a member of the Italien Knife Makers Guild, CIC.